Flexible work hours, aging architecture, and increasing competition for skilled workers are causing major disruptions in the workplace. How can we design the modern office to accommodate continuous change? During the 19th century, the role of office clerks were considered laughable when compared to the industrial labor jobs that had come to dominate western economies. At the turn of the 20th century, a new classification of work took hold of the western world and offices were run under the same efficiency as the factories before them. In the subsequent years, commercial skyscrapers pierced the urban skies and rows of cubicles, suits, and typewriters became a defining feature of the modern economy. While traditional offices provided essential centralization for a large share of the prevailing workforce, this is now beginning to shift. A growing emphasis on the knowledge economy and liberating digital tools such as Slack and Google Hangouts means that as many as 1/3 of employees may be working remotely at any given time. Today’s workforce is also more diverse than ever, comprised of four generations, all with varying needs and preferences. However, by 2025, millennials are expected to make up 75% of the global workforce. This generation has high expectations for their employers, place a strong emphasis on work-life balance, and want to work for an organization that reflects their personal values. Flexible work hours, aging architecture, and increasing competition for skilled workers are also causing disruptions in the workplace, leaving us to ask: So just how do we design for the modern workplace? Considerable research has been conducted in recent years to better understand how office environments can help or hinder productivity. Researchers have identified several variables that affect productivity in the workplace, including: ventilation, thermal conditions, air quality, lighting, noise, and security. This understanding can help organizations to inform smart environments that consider employee needs and productivity within their architecture. 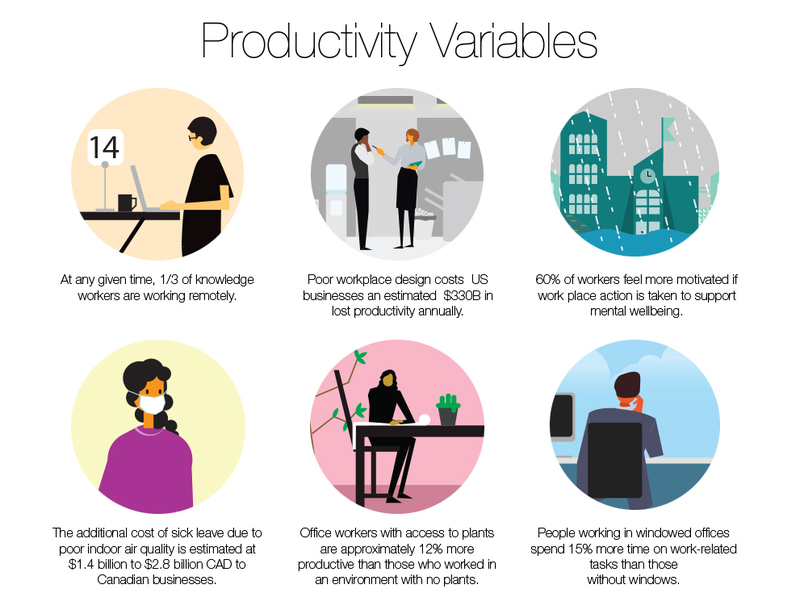 It’s important to note that productivity can take many forms – many of which are impacted by the physical workplace. 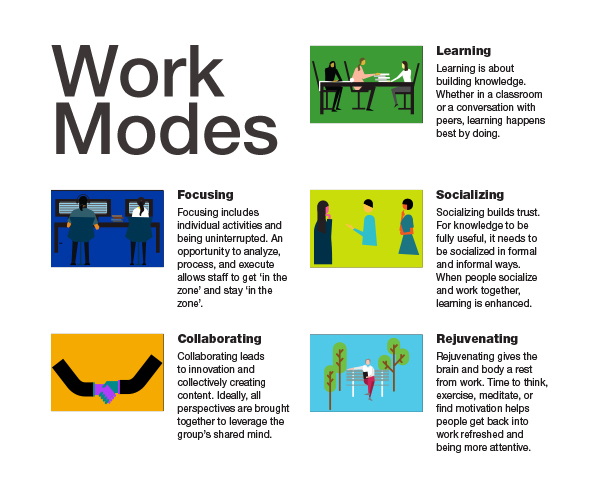 Office layout has the ability to influence individual work modes such as: focus, collaboration, learning, socializing, and rejuvenation. While a large proportion of offices have made the switch to open floor plans, many people complain that these layouts interfere with their focus, as these spaces tend to be noisier and more distracting. Employees have also complained that open floor plans make them feel easily replaceable and as if they are just a ‘small cog in a large machine’. Studies have shown that open floor plans also create sexist work environments and can make women feel disproportionately watched and uncomfortable compared to men. Conversely, those in favor of this design have reported that open layouts support collaboration and create more opportunities for spontaneous interaction. As the future of work remains uncertain, open concept layouts are superior in their ability to address the need for flexible and adjustable workplaces. Offices should be mindful of the concerns that coincide with these layouts and aim to minimize disruption by acknowledging the need for quiet work stations within the open setting. Soundproof collaboration rooms, phone booths and meeting spaces are some of the successful solutions adopted by offices thus far. Businesses should view changes in the workplace as exciting opportunities to freshen up the organization’s image as well as the environment. Numerous offices have identified moves or renovations as catalysts to eliminate clutter from their space as well as a time to strengthen a company’s identity. This transition not only impacts employee productivity, but also enhances staff pride. Employee satisfaction can lead to a firm outperforming its peers by upwards of 3.8% in long-run stock returns and should be seen as largely beneficial for the practice of the company. Organizations should seize the uncertainty related to office redesign as an opportunity to take leadership and embrace changing workplace practices and demographics. By involving employees with an array of varying roles within a firm, workplace design can also be used as an opportunity to foster cross-collaboration and boost team spirits. It should be seen as a chance to reflect shared beliefs and values which contribute to the vibrant workplaces that employees are excited to be a part of. While it’s certainly no small task, the workplaces of tomorrow are informed by the actions of today. Have you considered giving your office an upgrade? This article is based on the findings of “Workplaces of Tomorrow“, an internal Pocket R&D report by Graham Handford and Lauren Ritz. Pocket R&D is IBI’s tactical micro-research initiative that taps into the knowledge of our talent pool to inform how we can define the cities of tomorrow.